Looking for a good investment? If you are afraid to take risks because you’re scared of getting disappointed, check out Husky. 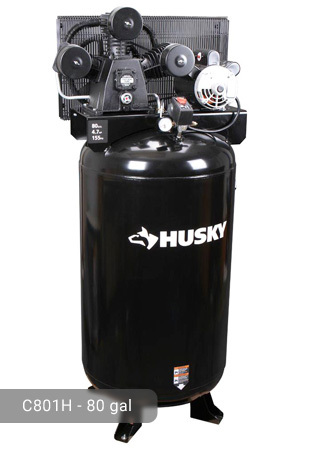 With Husky 60 Gallon Air Compressor C602H, there is no need to worry because it is guaranteed to be 100% cost-effective and efficient. 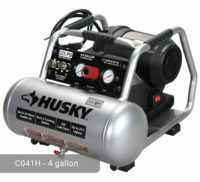 The air compressor features a cast iron pump with a maximum pressure of 155 psi. It can deliver 13.4 CFM of air at 40 psi and 11.5 CFM at 90 psi. 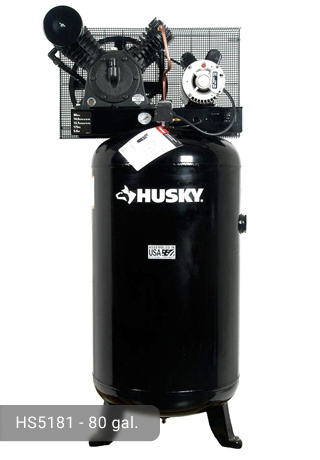 The cast iron provides an extended life for this Husky 60 gallon air compressor. The induction motor of this model has a power output of 3.7 HP. Maximum power is achieved with this output. As such, it is the perfect air compressor for DIY tasks for your automotive shop and both light and heavy-duty garage applications. These include, but are not limited to, the following: air brushing, grinding, roof nailing, sanding, surface preparations, HVLP paining, and hobby nailing. The pump is oil lubricated so it would require more maintenance activities than models which are oil-free. Expect a durable pump because of the synthetic oil that has the right mixture to make the operations of the air compressor smooth. Should there be a need to transport the air compressor, it should be positioned upright to avoid leaks. 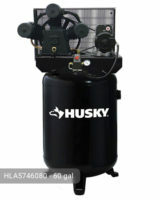 When using the Husky 60 gal air compressor C602H, make sure to check the level of oil and change it as necessary. The tank has a massive capacity (60 gallons) which serves as a huge reservoir for compressed air. The larger the tank capacity, the faster your tasks will be accomplished. More air also means longer run times for several pneumatic tools such as spray guns, ratchets, impacts, hammers, etc. You can run these tools all day long. The tank, made of steel, is ASME certified which means that it is safe and has passed the minimum requirements for it to be considered as a good-to-go product. Because of its huge tank, it was not designed to be portable. It has a weight of 208 lbs. so it is better left stationary. You can bolt it to a wooden floor to prevent it from being knocked over. A restraint that can be attached to wall may also be done. The tank has a slim design so do not worry about the machine taking up too much space in your work area. Unlike other models which produce annoying sounds, this model only produces sounds of up to 84 decibels. It is still a bit loud but not as annoying as the others. The air undergoes a single-stage compression which is enough to ensure the delivery of high-quality air. To make sure that pressure is regulated well, the air compressor has a pressure gauge and an on/off switch. This gives a certain level of control to its user. It is easy to manipulate and assemble except for the power cord which would require a professional for wiring purposes. To operate, it requires a 230-volt electrical power supply, AC only. The package does not include a power cord. However, it is readily available in home equipment stores within your locality. It is recommended that you ask for the assistance of a certified electrician in wiring the compressor for power. 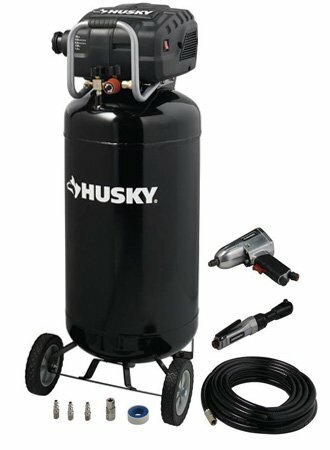 If you are fond of something that makes life easier, Husky 60 Gal. Stationary Electric Air Compressor is the right stuff for you. 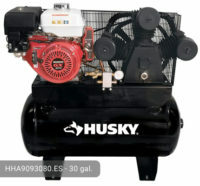 Air compressors by Husky do twice as much as other models but cost less. It costs about $449.00 so make sure to check it out. It is definitely a good buy. Hurry now while supplies last! If you already own Husky C602H model or just want to buy it, feel free to share your review or ask a question through the form below. 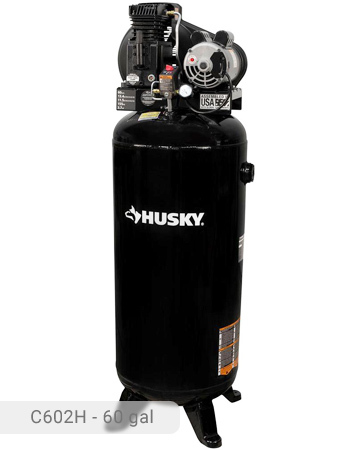 We have a Husky Model 602H Air Compressor – I wish to know should there have been a separate Pressure Vessel Certificate supplied with the product or is this covered by the Certification CAN/CSA STD C22.2 No 68-09. I can’t figure out how to switch the wiring.. Is this possible to change its wiring from 240 to 120 volts? Unfortunately, You cannot do this. The motor on this compressor requires 240 volts to run. It cannot be switched to 120 Volt. If there is no 240V outlet available then you have two options. 1. pay an electrician tons of money to install a 240V outlet. 2. return this compressor for a smaller 120V compressor. Unless you are running a body shop or have very High-demand air tools this compressor is really overkill. A 30 Gal compressor will do you just fine on almost all home uses.